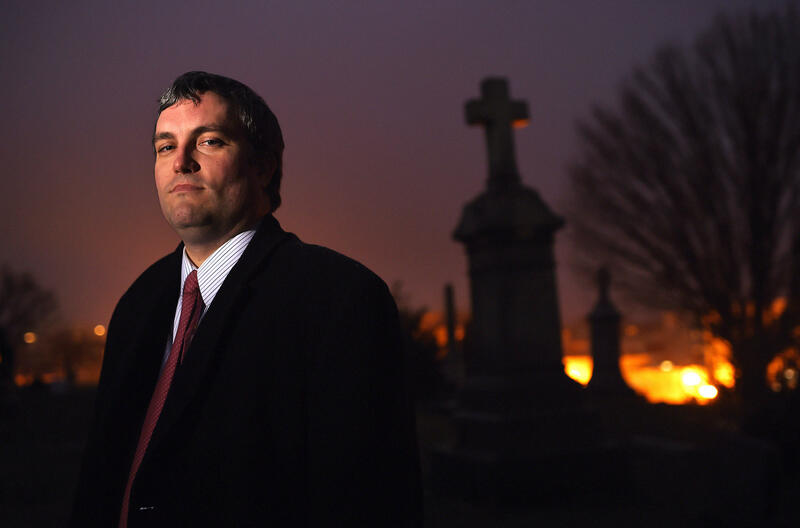 Brett Talley stands in Holy Rood Cemetery in Washington, D.C., in 2014. Talley had been rated "unanimously unqualified" for a lifetime judicial appointment and his nomination "will not be moving forward," according to a Trump administration official. Even after Talley's nomination advanced through the Senate Judiciary Committee on an 11-9 party-line vote, media reports and good government groups cast doubt on his credentials for the spot on the U.S. District Court in Alabama, along with raising questions about his alleged failures to disclose blog posts and his wife's work in the Trump White House. Talley, a Harvard Law School graduate, came to personify a wave of criticism over the Trump administration's judicial selections. The pressure intensified this week, when Sen. Charles Grassley, R-Iowa, who leads the Judiciary Committee, called on the White House to withdraw Talley's nomination. The Alliance for Justice, a left-leaning group that follows judicial selection, said the reconsideration of Talley could amount to "a real turning point, if the White House uses this moment to reassess its criteria for judicial nominations and to put forward nominees who will be serious about upholding critical legal rights and protections for all." While President Trump's agenda in Congress has run into trouble this year, his record on confirming federal judges is notable for its speed and efficiency. The Senate is preparing to confirm more appeals court judges before it leaves Washington this week. And Trump himself plans to appear at the federal courthouse in Washington, D.C., Wednesday afternoon for the swearing-in of Gregory Katsas, his deputy White House counsel. Katsas soon will become a judge on the prestigious federal appeals court in Washington, the D.C. Circuit, which is widely considered the second most important bench in the nation. Earlier in his career, Talley worked as a speechwriter for Republicans including Mitt Romney and Sen. Rob Portman of Ohio. And he had the support of Sen. Luther Strange, R-Ala., for whom he worked in the office of the state attorney general. Talley is currently an official in the Justice Department office that helps pick judges.